Gameplay: This is a keyboard controlled game that has one timed sequence, some running and careful movements. The initial main menu has the new game, load, options, extra gallery and quit. The main menu is accessed during gameplay using ESC. The gameplay main menu has return to game, load, save, quit and options menu. There are 30 saved game slots. The options menu has the controls, sound, subtitles and graphics menu. The controls menu has adjustment for the default movement controls: run is left shift, next object is page up, previous object is page down, creep is left Ctrl key, pause is ESC, inventory is spacebar. Toggle or press the spacebar again to close inventory. The action map positions are: up is W, down is S, left is A and right is D. These keys are used together with the action console at bottom right of the screen. Additional action is a combination of the action with the arrows for direction of the action needed. To combine items in inventory use the left action (2 boxes with an arrow) panel after selecting the items to combine. During gameplay an action console panel is seen at bottom right of screen. It has the action (gears), look (eye), change in position of inventory, etc. Use page up and page down to cycle the command icons on the action map. Use page up and down also to cycle the hotspots that can be interacted with when there are more than one shiny star lit on items. The game gives endless chances even after the gamer dies over and over and over. Read the character's notebook to check developments and clues. The Preceptor talks with his men - It has begun! Power is already building. The price for failure is Armageddon. Note the symbol on the floor - lightning symbol and a broken sword. In a plane over the Congo, George talks with Harry, the pilot. The plane passes through a weird weather area, got hit by lightning and crashes. In Paris, also experiencing bizarre weather, a computer hacker opens his door to a hip tattooed woman named Nico. He has decoded the manuscript. He knows too much. Back of the plane - George wakes up. Press S to use bottom action gear on the console panel. George unbuckles the seat belt. Look at (D) and try to open (S) the window by the chair. Go to the end of the plane (directional arrow), look and try to open the door. Pick up the beer bottle from the floor. Go to the cockpit and the plane tilts over the cliff. Whoa! To stop the plane from tilting: Go to the foreground part of the crate on the left of the plane. Look at the buckle and strap that holds the crate. Free the crate. Go to right of crate and pull (S + right arrow) the crate to the middle of the plane. Go to back of crate and push (S + down arrow) the crate to the very back of the plane. Cockpit - Go to the cockpit and look at crack on the window. Position George to look at fire extinguisher on the floor. Look and pick up the fire extinguisher. If a drop icon is seen at the action map at lower right of screen, use page up or down to cycle to get a gear action icon. Once you get the gear icon, throw the fire extinguisher on the cracked window. Go out the window and George will say more weight is needed for the back of the plane. Get more weight at back of plane: Go to Harry and try to wake him up. Check (lens icon) Harry to get a bottle opener. In inventory, select beer bottle - it will move to the side of the bottle opener. Combine them by pressing the left combine icon to get open beer bottle. Select open beer bottle and while facing Harry, use the gear icon. Harry wakes up. Talk to Harry about everything. After the ballast dialogue, Harry sits on the crate at the back of the plane. Go out through the window. Great view! Jump to next ledge and then climb to the ledge Harry stands on. George is to meet a scientist named Cholmondely to patent his invention. Talk to Harry again. Walk right to the cracked ledge part. The ledge cracks and as soon as the next ledge is seen to the right, move to the right or else you'll fall down the cliff to the water. Climb the higher right ledge and Harry says he'll see you at the top. Go to the right wall and skirt over to the right around the small ledge. Use the S key and arrow to go around the small ledge. Before the waterfall, go down the front part of the ledge 2xs and jump to get behind the waterfall. Go behind the waterfall and up the ledge to the right. Go down, jump down and let George hand on the edge of the ledge. Use the A and the directional arrows on the keyboard to move George to the right ledge. Travel to the extreme right of the cliffside. From here, go up to the top and walk the skinny ledge left to the cave. Watch! A man is interrogated and killed by a pale skinned man. Thinking about her career, Nico walks up to the door of Vernon, the hacker she was to interview. She hears a shot. Listen and Nico will say she needs to get in. Look at the bulletin board on the left and take the pencil. She carries her notepad, lipstick and press card. How to enter the hacker's apartment: Open the balcony door. Pull the birdbath closer to the left railing. Climb the birdbath and jump to the other side. Push the birdbath closer to the left railing. Face the wall and climb the drain pipes. Use W and left arrow to get to the middle balcony. Look inside to see a body. The door is locked. Go over the railing and walk left to the left balcony. Look and see the gap on the door is too small. Use press card on door. Inside apartment - Enter and look around the bedroom. Take note of the familiar poster by the door. Listen and go through the door. See Vernon dead on the floor. Look around and pick up the shell casing from the murder weapon on the floor by the book case. Look and the zoom in on the hacker to get Vernon Blier's business card. Look at the computer and note that someone took the hard drive in a hurry. Kitchen - Go through the open entryway and Nico steps on a creaking floor. The murderer comes out and talks with the gun pointed at Nico. She knows Nico. Fight with Petra: As soon as the action icon appears - press S and left arrow to get Nico to hit the woman with the frying pan. Nico protects herself with the frying pan. Immediately press S when the door action appears and when Nico drops the frying pan and is about to be shot at the third time. Nico opens the fridge door. The gun is empty and the murderer escapes. Follow the culprit to the balcony and see a red car speed away. Vernon's kitchen - Go back to the kitchen and listen to the 3 messages in the answering machine on the kitchen table - Mom, Nico and Bernice, a girlfriend. Call Andre and the newspaper. Go the trash bin by the sink and pick up the bank statement showing that Vernon has little money. Safe - On the way out of the kitchen look at and fold the rug to see a loose floorboard. Pull up the floorboard to see a small safe. Trying the bank statement and phone number on the safe didn't work. Alley - Go down the kitchen balcony and ladder going down to the alley. Look at the trash cans on the left. Pick up the newspaper on the ground. Climb the wall on the left and pick up the wig. Look at the wig in inventory and note the blonde hair (trigger for sports car dialogue). Climb the wall again to go back to the alley. Front of Vernon's building - Go around to the front side of Vernon's building and talk to the woman sweeping outside a Brasserie opposite Vernon's building's main door. The blonde woman drove away in her sports car. Skateboarder - Go out to the street and talk to the skateboarder. There was a red E-type Jag sport scar seen. Park - Enter the park behind the traffic warden. Talk to purple haired Beatrice, Vernon's girlfriend sitting on a bench. Traffic Warden - Talk to twitcher, the traffic warden in blue at the corner. Show her the shell casing and she will say that it is manufactured in Prague; the gun was a Magnum and recently fired. The sports car's registration is 451 CAC 75. There was an old theatrical mask in the car. The police arrive and interrogate Nico at the apartment. Talk to the inspector about everything. Nico is arrested. Cave - Enter the cave and George talks to the dying man, Cholmondely. Susarro.... Look at the omega door with a slot at the center. On the table at right corner, pick up the postcard from Glastonbury, England and signed Bruno. Look at the postcard in inventory to learn the message of Bruno and that Susarro is on to the scientist. Pick up the magnifying glass from the table. Open the door without a handle - Look around and see a door without a handle. To the right of the screen see a square board on the floor. Get George to stand on it and see that it opens the door - the old pressure pad trick, eh. Push the black crate to the square pressure pad on the floor. Inventor's machine room - Enter and look at the housing with a hole on the wall. Left of the machine is an opening high up on the wall. Go further in to see a giant power machine attached to gas cylinders. Look close at machine and turn it on using the left arm of the machine. It sputtered like it needs fuel. Look to the lever on the right that is somehow connected to the gas cylinder. Pull the lever and the machine explodes. To get out of the cave - Take the lever on the floor that blew off the machine. Insert the lever on the housing with hole by the door to get the door to remain open. No need to pull lever down. Take the lever from the housing by the door. Push the crate that is over the pressure pad next room to the machine room and under the opening up on the wall left of the destroyed machine. Climb the crate and up the opening. Out of the caves - See a bird's nest up the wall. Use the lever on bird's nest and then pick up dry as tinder bird's nest. Go to bottom of screen and walk the skinny ledge to the other side of the cliff. Jump up, cling to another skinny ledge and go left using the W and left arrow action buttons. Go left until sunlight. Stone statue - Go forward and see Harry beckoning to you. See the 3 bad guys down at the bottom. Escape from Susarro: Look at the stone statue with remnants of fire. Place the dry bird's nest on charred remains. Use the magnifying glass on bird's nest. Fire comes out of the stone statue and 2 of the bad guys run. George accidentally slides off the top and falls at the bottom. As soon as Harry calls out immediately run (Shift + directional arrow) and jump (S) to the back of the jeep. Take any side street and find yourself coming up back on this street. Weird! Let's go find information about Bruno. Cosmic Faerie - Enter the Cosmic Faerie down the street. Look at the stand by the glass case and see postcard similar to the one found in Congo. Look and read the ouvre with 'silver' plated coins on the cover in the stand in foreground. Read more than once the poetry and George will say the poetry is pretty good. Talk to Tristram Hillage and ask about the postcard and ask about Bruno repeatedly (hear floor creaks and flushing). Go to the bottom screen and try to go upstairs to Private Area - customers are not allowed upstairs. Exit after looking around. Pacing man - Talk to man, Colonel Butley - father of Melissa who has a Purdey in his landrover. Talk about Tristram who rents his room. Zazie's Kiosk - Talk to Madam Zazie, who only accepts silver to cross her palms about the postcard. We saw 'silver' in Tristram's poetry book, right? Eamon O'Mara - Cross the street. Talk to the man who has a BBC program sitting waiting for the pub, The Yeoman's Arms to open. Cosmic Faerie - Talk to Tristram again and after talking about the poetry book and O'Mara - you will be given the poetry book with coins. In inventory, combine metal rod with poetry book with coins to separate the 3 silver coins from the damaged poetry book. Madame Zazie's - Talk about Eamon and silver for the postcard reading. She needs 'more personal something' from Bruno to get a better reading. Eamon O'Mara -Talk to Eamon about Tristram. Eamon reads the poetry to find out that Tristram copied the poetries. Eamon runs to the Cosmic Faeries. Cosmic Faerie - Watch the men argue. When George says it's time - go to bottom screen and up the stairs to the private area. Talk to Melissa and find out about Bruno. Go down and talk to Tristram. You will end up blackmailing him to get Bruno's shorts. Ugh! Madame Zazie's - Talk about silver for the boxer shorts reading. Dragon fire and man visions are seen. Madame Zazie faints. Burning Pub - Exit the Kiosk and see the back of the pub burning. Go to the door left of Eamon. It is locked. Go back to Eamon and ask for his help. When both heroes open the door, enter and see a monk and the burning building. Enter the burning building - Go to front of the burning building on the right. See a window on top floor. Move the 2 single crates to form a line under the window. Then push the top crate over the crate under window. Climb the crates and enter the window. Bruno - Untie Bruno. Talk to Bruno, an old Neo Templar acquaintance of George to learn what all this is about. He talks about geomantic energy which the Chinese calls the dragon current. The Temple of the Dragon has been activated by Susarro causing the world to be in danger. The Cult of Dragon has Susarro as its leader. Listen to the party at the Cosmic Faerie. Nico's apartment - Listen to the phone messages and then use the phone to call Andre and the newspaper office. Let's follow Andre's advice. Look at the table on the bottom screen and see the clown's nose. Look at George's picture at shelf by toilet door. Leave the apartment. Vernon's apartment area - Go to the front of the main door to Vernon's apartment. Talk to Edith with rollers in her hair. When she leaves, the sweeper tells Nico about what Vernon said - power was building and manuscript. Enter the main doors to the apartment building on the left. Go upstairs and find out that Vernon's apartment and balcony doors are locked tight. Enter Vernon's apartment - Go to the alley behind Vernon's apartment. Climb the fire escape ladder to Vernon's back balcony. Look at the door to note that the key is inside the door. Use the newspaper taken from the alley ground earlier on the door. Then use the pencil taken from the bulletin board on the lobby of Vernon's apartment on the door. Pick up the newspaper and key that was slid under the door. Use Vernon's kitchen door key on door and enter. Kitchen - Go to the sink and take paper tissue. Vernon's bedroom door - Hear sobbing and enter to talk to Beatrice. She won't talk to you. Give her the tissue and Nico can talk to her now. Some people want Vernon to crack an old manuscript and threatened him 6 months ago. Ask about the safe and Beatrice will mention about Vernon's faulty memory and his continued asking her birthdate - 23rd of October. Leave the bedroom and Nico told Beatrice to contact her at her apartment. Safe - Use the safe and Beatrice's information to open the safe. Inside were a hand drawn diagram and DVD disc. Leave the apartment through kitchen door. Red sports car - Once on the main road, the red sports car tries to run Nico down. Immediately go right by using S and right arrow. Nico's apartment - Place the DVD on TV and DVD player. Vernon's recording for Beatrice stated that the weather that is now occurring is predicted in the Voynich Manuscript (information about the manuscript can be read at main menu). He talks about ley lines or Dragons lines. The people who paid him want to harness the power. 2 things are important: Key of Solomon and the phrase - Devils and Witches dance with cows on the Sabbath. Use the phone and talk to Andre. He comes and watched the DVD. Andre talks about the Book of Solomon and Ile St. Louis - Cow Island. Talk to Andre about everything and Nico will say - I know just the place to phone. Use the phone to call the newspaper and find out about the condemned old theatre at Ile St. Louis. Talk to Andre about L'Heiroglyphe. Go to the door to depart for the theatre. The phone rings and after a discussion with the newspaper boss, Nico quits. Nico exits a taxi in front of the abandoned theatre. She says she needs to get inside. Check the door. Check around the area. Go to the right screen and to the side road right of the old theatre. Walk the left side of the street and check the fire escape ladder right of the restaurant. It's pulled up and too high to reach. Check the door to the right of the ladder. Go down the end of the road and check the red sports car and verify that Nico is on the right track. Look at the mask on the passenger seat. Main level - Go across the road and walk back under the scaffolding. Walk to the road curve under the scaffolding that is not fenced in - just across the fire escape ladder across the street. Jump up to first level. Second level - Climb the ladder to second level, walk to the very end around the corner and jump up to the third level. Third & fourth level - After a few steps on third level, jump up to fourth level. Walk around the corner and jump down right of the fence on to the third level. Billboard - Climb the ladder and see a billboard on the right. Stand parallel the first posts to climb up to top level. Look at the billboard attached by a string. Untie the billboard - nothing happens. Go down and backtrack to the second level under the billboard. Instead of going down the ladder, jump across. Walk to the end and stand parallel to the post with the light. Jump up. Now, look at the billboard. Remove the metal clip of the billboard. Watch Nico cross to the old theatre building, billboard falls and Nico is now trapped. Climb the ladder. On the roof, walk to the left of the wide platform at foreground and climb down the ladder. Open and enter through the door. Go down and out to the opening at top left of the big room. Go down the steps to the door. Go through the door to the main theatre. Look around until Nico hears somebody coming, hides and gets caught. Petra introduces Nico to Susarro and Flap took care of Nico. Watch Bruno take George to the place that is shown by his Power locator machine reading. Talk to Bruno. Book Repository: Go across the road. Check the door of the book repository. George says to find another way inside. Go through the arch and turn to the left of the screen. Go to the very end and by the wall right of the white panel above the short open wall with a slashed P. Look at the white lid and find that it is propped open. George says he needs more height. Move the crate by the wall left of the dumpster to right side of the white panel. Climb the crate and pull down the lid. Climb up and look at the lid and see that there is a broken window with a latch. Move the latch through the broken pane. Open the window and enter the book repository. Inside the book repository - It's very dark in here. Go to bottom screen and then to the left wall and see a light switch. Turn the light switch on and find out nothing happens. The exit to the book room is on the right of the dud light switch. Enter through the door. Another storage room - Follow the wall to the right in the book room, pass a file cabinet and enter the door on the left. See a light switch hidden behind a crate left of the door. To get to the light switch - Move the single crate on the left closer to the 2 crates covering the light switch. Go to left screen and then to the left to see another crate. Move this crate to left of the crate assembly by the light switch. With 2 single crates left of the double crate by the light switch. Climb up the single crate and pull the top crate over the middle single crate. The light switch is now accessible. Trap door - Look at the floor by the middle crate and see scratches. Go back up and push the crate to over another crate. Go down and pull the middle crate out of the way to see a trap door on the floor. Old Theatre - Enter the trap door and go through the tunnel and up the metal ladder. Go up another ladder and George will end up watching a show on stage. He finally realized that it is Susarro and Nico up there. When only Nico and Flap are left, it is time to find a way to save Nico. Save Nico - Go left and go down the aisle towards the stage while staying in the shadowy areas to the opening at the end of the aisle. Climb the ladder and when on top of the rigging realize that the walkway to the other side is impassable. Go right towards the back wall. See a rope attached to the lights metal rigging. Pull rope and it will stabilize the rigging. Jump up on it and move George to the left walkway. Go to the front walkway and see 2 sandbags. Look down and see Flap and Nico. Drop the closest sandbag on Flap and immediately drop the second sandbag to land it on Flap. Watch George and Nico's reunion and the update of the situation. Talk to Nico and then check Flap. Move to the rear left of the stage and go down the steps. Go down the steps again to the basement. Basement - Turn right by steps and enter the screened room on the left. See a lift operated by a button. Go to crate by the left exit and take a tube of theatrical grease paint. Go left of the main hall and then right. Dressing room - Enter a dressing room. Check around and see a new locked safe under the dressing table. George will say the floor buckled under the weight of the safe. Exit the room. Subbasement - Go down to the end of hallway top of screen and enter another door in the alcove. Go down the steps and hear shots. A guy behind the door starts shooting and is very afraid. Room under the dressing room - Go back to the hallway in front of the steps and enter the first room on this hallway just under the dressing room. See a fuse box with only one fuse left. Look at the strut at middle of the room and George will say it holds the safe up above. Try to move the strut and George will say the friction from the floor is too great. Needs some greasing. Use the theatrical grease on strut and find out it is too old. George wants a liquid lubricant. Exit the room and go down the hall to a big metal door and a mutilated body. Look at the panel right of the door - it needs a keycard. Go back upstairs. Foyer - Go out to the back of the audience sitting area and left to the red carpeted area. Go down to the foyer down to the bottom screen and enter the popcorn stand at bottom of the screen. Pick up the disposable cup that Nico crushed. Stage - Go back to the stage and climb up. Note the hot stage lights at edge of the stage. In inventory, use the A (combine icon) on the paper cup to move it aside. Scroll to theatrical grease paint and then use the combine A icon again to make cup holding grease paint. Then use cup holding grease paint on hot stage light to make melted grease paint. Go back to subbasement and the strut. Room under dressing room - Use the melted grease paint on strut. Move the strut but George can't do it alone. In inventory, select Nico and the click S-gear icon while looking at the strut. Watch! That's one way to crack a safe! Look in safe and pick up 2 things: a security swipe key card and crystal covered artifact. Exit room and go to the metal door with the mutilated body. Use the key card on the panel right of the metal door. Nico and George go down on the elevator. Tunnel - Walk through the tunnel and see a forked lightning carved stone. Omega power cavern - Enter the cavern and see an impressive sight - 3 cobras with a floating artifact inside a flow of energy. It is surrounded by crystals and lightning energy flows through the center to the surrounding crystals. At the center is a column of energy. George can place his hand through the energy column but not Nico. Use the gear icon to get the slab of rock floating at center of the energy column. The stone has an omega symbol on it. Remember where we saw similar to this? Escape - Watch the men run away from the Grandmaster. Susarro and Petra climbs the elevator. As soon as control of the game is taken, run to the foreground edge of the bridge and climb down (shift + down arrow and then A). Move George close to Nico. Climb up and Susarro sees them. Run up to the hallway (shift +up arrow) to the elevator. The screen view changes fast - so be sure to adjust the directional arrow immediately. Elevator goes up. Stop pursuit - Now you can take your time. When elevator opens, use bottle opener from inventory on elevator while Nico holds it open. Leave the theatre - Do not go to the stage steps or you will meet the baddies. Go to the screened room under the stage and press button to lower the trapdoor platform and the counterweight is up. Climb up and step on trap door platform. Press the button while up the platform. On stage, jump off the stage and go to the ladder at the back of the audience area. Watch! Susarro and Petra look at the broken safe and Petra promises to kill them for Susarro. Outside the book repository - George is zapped by a stranger. The crystal covered artifact is taken but George held on to stone cylinder left by the zapper. At Nico's Apartment, the good and bad news are told to George when he woke up. Exhaust all dialogues with Nico, Bruno and Andre. Bruno explains about Susarro and the Armillary, the machine at the Temple of the Dragon. Andre explains the findings of Vernon. The crystal artifact is the Key of Solomon. The diagram is how Susarro found the location of the Temple of the Dragon. The only clue to follow is the Omega stone and the Omega slot on the door at the cave in the Congo. Harry drives Nico and George to the stone statue clearing. Go to the door and find it locked. Use the metal rod on lock but the rod is too wide. Select Nico from inventory or talk to her to pull the door. Then select the metal bar again and use it on the door. The padlock is broken. Subtle is extra! Cholmondely's lab - Enter and go to the omega door with the slot at center. An earth tremor occurred. Use the omega stone on the slot at center of the door. Spike hallway - See a dead guy on the floor. Walk George towards the dead guy and Nico pulls George away from the spikes. Go to safety at other end - Is it weight triggered? Go to wall and jump up. Move George to end of the hallway to safety. 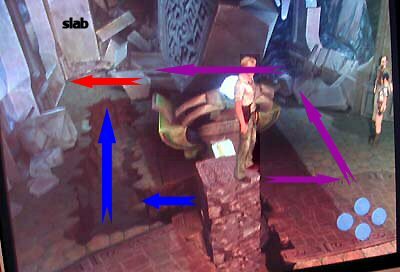 Check the dead man - Move one of the stone blocks to the center of the first part of the spike hall until the screen view changes to George's front. Then push the other stone block behind the first one leaving a space in between. Climb up and go to space between the stones and push the other stone to the second part of the hallway. Climb up and then down to check the corpse. Examine the corpse and take the ancient scarf. Look at ancient scarf in inventory to note that it has a coat of arms with a lightning symbol and a broken sword. Inside the scarf is a metal plate with a lightning symbol on it. Get Nico across - Go back to the safe end of the hallway and look at the gears on the wall. Insert the metal rod from inventory between the gears. Nico comes to safety. Hahahaha! Floor tile room - Enter the floor tile room. The principle of the puzzle is to step on safe tiles to get to the other end of the room. There are several lit blank tiles all over the room. The blank tiles are the safe tiles to rest on. You have to select an iconed tile that goes from blank tile to blank tile. To see the path, step on the tile icon near the entrance and see the corresponding tiles lit up to show the safe path. In inventory, ask Nico to stand on a tile and walk George to find the safe way across. You must be standing on a blank tile when changing iconed tiles. If you stand on unlit tile or outside a lit tile the ceiling comes down - you die. Ask Nico to stand on the Fish tile. Walk George on all 6 lit tiles ending on a blank tile. Ask Nico to stand on the Scorpion tile. Walk George on only 7 of the lit tiles ending on a blank tile. Ask Nico to stand on the Snake tile. Walk George on the lit snake tiles ending on a blank tile. Ask Nico to stand on the Fish tile. Walk George on the lit fish tiles ending on a blank tile. Ask Nico to stand on the Bird tile. Walk George on the lit bird tiles ending on a blank tile. Ask Nico to stand on the Scorpion tile. Walk George on the lit scorpion tiles ending on a blank tile. Ask Nico to stand on the Snake tile. Walk George on lit snake tiles that go left and then down ending on a blank tile. Ask Nico to stand on the Snake tile. Walk George on the lit snake tiles. Jump up on the platform. Nico is now left behind. Caved in floor hallway - Go to bottom left of screen wall with the cave in the foreground. Jump down to a ledge. Jump across to next ledge. Jump down and move George to the right above another ledge. Jump down to the ground. Look at the crystal embedded in the rock. Balanced slab cavern - Enter the opening to a temple like cavern. There is a large slab balanced over a stalagmite. There is an opening at right ledge that you need to reach. Climb the stones podium on the left and cross over the slab. The slab teeters and George falls off. We have to stabilize the slab. Stabilize the slab - Climb up the block podium on the left. Climb and drop down behind the pink carved block (let's call it B) above the bottom carved block. Push the carved block over the other carved block (let's call it C). Push block B to the left part of the structure close to another carved block on top of the structure (let's call this one - A). Move the bottom carved block C that is close to the slab and fit it on the space below the 2 carved blocks (A and B) on the left side of the structure. Push the first moved block (B) to the niche to the right of the carved block (A) above. Move the top carved block A to the right. Pull the carved block B on the niche and move it to another niche by the moved top carved block A. Place the lower carved block C that was moved on the left back to its original position. Push the top carved block A to the right. Move the middle carved block B back to its original position. Now move the top carved block A to the left end of the slab to hold it in position. Cross the slab and enter the opening on the wall. Mechanical device room - Look around the room and study the 4 giant mechanical devices. Note the placements of the crystals and holes in all of them. The one closest to the next room cannot be moved. The next room that has a lightning insignia over the arch is full of crystals that are not activated. Go to the control console at other end of the mechanical device room. Mechanical device puzzle - The object of this puzzle is to combine all the 4 mechanical devices into one by inserting one after another to bring energy to activate the crystals in the next room. Standing on the console, the immovable mechanical device is the one at NE position. The console is operated by pressing S to rotate the energy flow that will move a device to the center. Once a device is at the center, it can be rotated using A or W. The devices should fit with the protruding part inserted to another. Press arrow (A or W) to change the flow of energy from SE to NW. Press S to move SE device to center. Press the arrows to rotate SE device to a position wherein the protruding part faces the unmovable NE device. This also diverts the flow of energy from SW to NE. Press the S-gear icon to move SE device to join the NE device. Hey, it worked! Press arrow (A or W) to change the flow of energy from NW to SE. Press S to move NW device to center. Press the arrows to rotate NW device to a position wherein the protruding part faces the unmovable joined NE devices. This also divert the flow of energy from SW to NE. Press the S-gear icon to move NW device to join the NE devices. We have to turn SW device by pressing S to bring it to the center. Press arrow to rotate SW to a position wherein the protruding part faces the unmovable joined NE devices. Press the arrow to change the flow of energy from SW to NE. Press S-gear to move SW device to join the NE devices. Watch to see the flow of energy shoots out to the next room. Go to the joined mechanical devices and look at the control panel on the first part of the devices. Operating the panel reverses the energy flow. Make sure the flow of energy is going to the other room. Crystal room - Enter and see that the flow of energy passes through a crystal and is diverted to the wall. There is a giant machinery part that blocks a staircase. Crystal puzzle - The object of the puzzle is to align the crystals so that the flow of the energy moves the machinery part that blocks the staircase to a position that will make the 2 touch sensitive panels in the alcoves accessible. With the energy flow going to the crystals from the device next room, turn the first crystal (1) so that flow goes to the left crystal. Turn left crystal (2) so that the flow of energy goes to the crystal below it. Turn this crystal (3) so that energy goes to the crystal on the right. Turn this crystal (4) so that the energy goes to the crystal on top of the room. Turn this crystal (5) so that the energy goes to the giant machinery part that is on its left. The machinery part is pushed by the energy flow to far wall making the panel by staircase accessible. Turn crystal (3) that is located at middle of the room so that the energy goes to the crystal at left alcove. Turn this crystal so that the energy goes to the crystal left of it. Turn the left crystal in the alcove so that the energy goes to the crystal below it. Turn this crystal so that the energy goes to the machinery part that was pushed to the wall and is now blocking the other panel. Go next door and press the control panel on the side of the first part of the joined mechanical device. This will reverse the flow of energy that is coming out of it. The flow should be coming into the device not going out. Go back to crystal room and see that reversed energy flow pulls the machinery part away from the alcove with the other panel. Both panels are now accessible. Climb the stairs and a panel will open where Nico was waiting. George will call Nico to go back with him down to the crystal room. Look at one of the panel and in inventory, call Nico to control one of the panels. Go to the other panel and operate it. Together, George and Nico lit up the lights above the door to the right of the crystal room. The lights opened the door. Exit the room. Lightning room - Walk forward and feel earth tremor. Enter the lightning room. See a slab with the lightning insignia on the floor in front of the closed door and a recess on the wall with the insignia similar to the metal plate taken from the corpse. Insert the metal plate on recess and the door opens. The metal plate falls off and the door closes. Pick the metal plate and feel it hot. Insert metal plate on recess again and operate again so that George will hold it in place but it burns George's hand. One more try - Insert metal plate on recess again, immediately use the ancient scarf on metal plate to hold it and the door stays open. Since you cannot continue to hold the metal plate and go on with the game, let Nico hold the metal plate. Enter the next room. Alpha power cavern - - Find yourself similar to the one in Paris. Take the Alpha artifact. Go out of the room and join Nico. Escape from Petra - As soon as you exit the lightning room, Petra appears. When the earthquake starts, run. Again, the screen view changes fast so that the directional arrows need to be adjusted immediately George and Nico will rest and a ledge falls off - as soon as action panel is seen, run to and jump the ledge. If not successful, trigger happy Petra will get both of you. If I can do it - you can do it! Of course it took me forever. See Nico and George jump on Harry's jeep. Nico's apartment was ransacked, Andre was attacked and Bruno was taken. From information stated by the Inspector, it seems that Susarro has influence all over the country. Bruno was taken to Prague. The inspector will help them gather information and he leaves. Beatrice arrives and Andre falls for her beauty and charm. Beatrice invites Nico and George to stay at Vernon's apartment with her. Nico will check the old theatre's office to gather information. Basement - Go down to the subbasement where the safe fell off but the door going down is locked. Go to the dressing room and see the hole the safe made. Jump down the hole. Office - Go to the door where the shots and yelling from a frantic man came from earlier. Exit the dressing room, go to left passage and open the door on the right. Examine the room. Check the papers on the credenza. Enter the next room and Flap starts to choke Nico. Immediately, press S to take the vase and hit Flap. Nico will tie Flap with the ancient scarf. Look at all the torn paper and map in the next room. Check the paper on the table. It is a security report of a private residence but no address. Prague is mentioned. There's a picture of a castle with a dragon depicted on the back. After the car broke down in front of the castle, use the intercom and meet the guard. He will not let George in. Distract the gate guard - Look at the intercom and then use inventory to tell Nico to distract the guard or talk to Nico and use intercom dialogue. Hide George on the shadowy front side of the left wall. When Nico walks with Boris the guard to the right front wall, creep (Ctrl + arrow keys) towards the open gate while staying in the shadowy area. Second set of guards - As soon as you are inside the gate, climb the walls on the left. Look at the pattern of the guards. The right guard with the dog stays where he is but the guard on the left moves around with his dog. Drop down on left garden. While staying in shadows, move to the other left wall. Climb up and down to the other side. From a top view, see the guard moves around with the dog. Time your movement when the guard and dog are far from you. Creep to the shadow on the wall of the left raised courtyard, climb the steps and stay in the shadows away from the spotlight. Spotlight area - Walk the shadowy area going down to the trash bins. Take the string (not used in game) from the first trash bin and go pass the dumpsters. Check the trash bin right of the dumpster and take the burger. Take the aluminum foil (not used in game) from the next trash bin. Continue to go around the area staying in the shadows and exit above to a crate area. Crate area - Look around and see that one of the curved area on top of the wall does not have a grill. There are 3 small crates beside the big one. Push the top crate to the next one. Pull the left single crate out, then navigate it to the front of the now double crate and it will be by the wall. Push the top crate over the single one by the wall. Climb up the crates and over the top. Outside castle wall - Walk to bottom of screen. At the corner, jump on the ledge. Here you will see a close view on top of fence and windows. Walk right on the ledge and George will appear out of the shadows. Move right until the front part of the castle. Jump down the glass patio, climb over the other side and walk the ledge to a small courtyard with a dog and a guard on the other side of the fence. Courtyard area of the castle - Go down the steps into a tree area. Exit on the right to a courtyard with a guard by the gate. Go across to the opposite side of the opening you went out from. Just cut across when the guard is not looking. If you get caught, try creeping across - left Ctrl and directional arrow. Another crate area - Pull the small crates away from the small crate closest to the wall on the left. Push the crate close to the wall and then climb up and down to next area. Guard with a caged dog - See a guard on the other side of the big crates. Walk to the bottom side of the big crate and get a close-up view of the guard at right and the fence where the dog is situated on the left. Look at dog and then throw the burger to the dog. The dog should run to the burger and stop barking. Then creep pass the guard by going up pass the big crate and then to the gate at right of the screen. Bricked courtyard - Walk the perimeter of the bricked courtyard to the bottom of the screen. Talk to Nico outside the gate. She will point out the helicopter and need for a remote to open the gates. Continue to walk the perimeter pass the trucks, fence with button, helicopter to the back of the building. See a jeep with a jack under it. Take the remote from inside the jeep. Go back to Nico. Use the remote on the door. The gate opens, Nico gets in and a guard comes around. Nico and George hide behind the big metal container. Storage area - Walk to the gate with the button. Check the button and see that it opens the gate but closes immediately. Ask Nico to press the button and then enter the shed. Take the car jack handle inserted on the door in the back. Turn to the wall in the background and pick up a coal (not used in game) from the ground. Jeep - Exit the area and go back to the jeep. Check the helicopter and the dark archway on the way to the jeep. No way in. Use the car jack handle on the red jack under the jeep. Push the jeep and still wouldn't move. Look inside the jeep and let the handbrake off. Now, push the jeep. I didn't mean that you have to hit the wall. Climb on the jeep and on the wall. Drainpipe - Go to top left corner of the patio. Look at the drainpipe and George, it is a way to the roof. George barely made it. Now Nico and George are separated again. Nico all alone needs to find another way in. Take the drain pipe bracket. Since you can't do anything up here, let's go down. Climb down to the jeep and walk over to the second limo left of the building. Climb on top of the limo hood. Look at window to see a small storeroom. Use the bracket on the small gap of the window. Wine room - Check the 2 barrels. One is empty and the other one has a tap that can not be moved. There is a rusted suit of armor in the corner. Nothing to do here. Inside the castle - Exit the room and Nico automatically crouches to listen to the 2 guards talk about Petra and Doner kebab. I'm not going into that conversation. Listen! They have not seen Petra close-up. Hmmm. Upstairs - Go back to the hall across the wine room. Go up the stairs and enter the far opening on the right of the hallway. Eek! The floor creaked. Nico hides when the guards come up to check. Go around the balcony and enter the hall at the opposite side. Check all the doors until the very last one opens. Petra's bedroom - Look around. Open the chest at the foot of the bed. Look at chest, use page down-up until the hand icon comes up and take the small hairdryer. Go behind the folding wall and open another chest to see a wig. Use page down or up until the hand icon comes up and pick up the brown wig. Look at chest again and Nico will knock on it to find out about a secret compartment. Examine the chest again (standing on right corner of chest and Nico will find a small button that her fingers cannot press. Use the pencil in inventory on the button. Look again and find an assortment of knives and a something wrapped in a rag. Use page up or down until the hand icon comes up and pick up the sharpening-grindstone. The wig is brown. Kitchen - Go back down to the main floor and forward to the other side of the hall. Enter the single brown door into the kitchen. See an unhappy chef. Try to take a vegetable from the chopping area and he will threaten you. Try to take the bleach on the shelf on the wall. Talk to chef while standing on his right (left of screen). Sorry, we got him to talk! My ears are still ringing. Find out that he doesn't have any thing to sharpen his blunt knives. Talk to the chef about the grindstone. When he turns to the sink to sharpen his knives, take the bleach from the shelf. Go back to Petra's room and the bathroom. Petra's bathroom - Place the brown wig on the sink and then add the bleach. Now use the hairdryer on the wig on the sink. Automatically, Nico wears the wig. Go to the balcony and Nico is stopped by a guard. Roof - On the roof area, move the crate to the wall with a green landing above just across the locked door and left of the way you came here. Climb the crate and up on the green landing. Climb up the steps to a locked door. Turn right and climb over to the ledge. Walk around, walk the teeny ledge with you back on the wall and walk around to the front of the castle. Drop down to the balcony in front of the castle. Jump up to the right ledge and move George to the right onto the next building. Climb through the open window on the left. Storage room - Play with the old oil lamp that dripped oil on the floor. Fire hazard. Climb the crates and see an opening hidden behind the crates. Move the crates to get to the opening. Climb the crates and over the top crate by back wall to the other side. Push top crate towards and over the crate by opening. Now pull the freed lower crate to the right and insert it to the open area right of the crate by wall, making 3 crates in a row (one has the top crate by opening). Climb up the crates and pull top crate to the right. Now you can pull the crate away from the opening. Go out the window and go forward a long way on the walkway to a bricked patio. Bricked patio - Move left between the 2 trees to the grate on the floor. Pull the grate up but it is so rusty. Looking down on it, George can see a pit with a window that led into the castle. Go back to the stairs going back to the walkway. Turn right opposite the stairs and look at the drainpipe. Take old tin cup that is used to block an offshoot pipe. Go back to the oil lamp in the storage room. Storage room - Open the knob of the oil lamp. Use the tin cup on the lamp to collect oil to get cup filled with oil and close the knob of the oil lamp. Go back to the grate at the brick patio. Bricked patio - Use the cup with oil on the hinges of the grate. Pull up the grate and enter. Nico's disguise worked. The guards are fooled. Foyer - Go to the door left of the guard on the desk. Operate the door to note that it has a card reader. Talk to the guard on the desk. Ask about the door and Bruno. The security sergeant outside has Petra's security card. Bruno is at Susarro's office at the lower level with 2 guards. Courtyard - If you want to you can talk to the guards at the courtyard. The guard by the door has a dog named rascal. Boris says you look familiar. The guard on the right has a dog named raptor. Go to the steps right of raptor and out to one of the side entrance by the guard at the other end. (Or you can do it the George way by moving the crates, up the wall and up to the guard with the dog path). Go out to the brick courtyard and talk to the sergeant guard standing under the arch in front of the trucks. He gives Petra-Nico an unvalidated security card. Foyer - Go to door left of the guard at the desk. Look at the door, then use page up to look at the card reader and try to use the unvalidated card on the card reader. It doesn't work. The guard says it needs to be validated. Security room - Go to the room on the other side of the guard at the desk and same side as the kitchen. Look around and then talk to the technician. She reports only to Susarro until preparation about the Armillary is finished. She flips the validated card on the desk. Harrump! Take the validated card. Foyer - Go to door left of the guard at the desk. Look at the card reader by using page up until the shiny star is the one above the door active icon. Use the validated card on card reader. Enter and see Nico on the steps going down. Dungeon area - Go down and see an empty old cell. Go forward and hear somebody coming. Nico picks up a fire extinguisher to protect herself. Laundry room - George lands on laundry bin. Look around and see an old washing machine at the corner and a trolley at opposite end of door. Try to get out through the door and find out it is locked. Move the old washing machine to the trolley. Push the weighted trolley to the door. Basement - Walk the hall and then turn screen left. Turn right at second right and see a modern door that has a card reader. Go forward to end of tunnel and be hit with a fire extinguisher. Guess who! After determining that blondes have more fun, talk to Nico about everything. Go left and see a guard guarding a door. George will be shot if seen. Guard room - Turn back and go to the modern door with the security card reader. In inventory, ask Nico to do something to this door. Nico uses the keycard and they enter the guard room. Go to corner closet and get modest George to wear guard uniform. Exit the room and go back to the end of the tunnel by the fire extinguisher. Turn left and approach the guarded door. After a short talk with the guard, Nico and George enter the guarded area. Tunnel - Go forward and see a metal door that needs a code to open. Go to the area next to the locked room. See a grill on the top part of the wall. Move the crates to the grill so that George can climb up and listen at the grill. Susarro's office - Nico and George talks to Bruno. Susarro arrives and after some pleasant chit chat with Bruno, Petra arrives. After reporting, Flap comes in. Susarro recognizes the scarf Nico tied him with and stated that the Key of Solomon is with the St Stefan chapter of the Knights Templar. Susarro goes to Paris to retrieve the key and Petra is to take Bruno to the Armillary. They leave through a secret panel behind a bookcase. Look at grill and George says that it is screwed on. Use the silver coin taken from the poetry book at Glastonbury on grill. The grill is removed. A funny byplay about George not able to get through the opening happens. Look at grill and use Nico in inventory to go through the opening to next room. Nico comes through. Go to room next door. Look at the map of the ley lines. The convergence of ley lines is in Egypt. Look around the office. Note the shield with a crest. Note the secret panel the baddies went through. Look at Susarro's desk while standing by the chair and see a button. Use page up to look at button and press the button. After a talk with Andre about St Stefan at Vernon's apartment, George decided to check the old meeting place of the Templars at the sewers at Montfaucon Square. Nico and Andre will check the location in Egypt. As soon as George comes to the Square, see a rope hanging on a scaffolding at the foreground. Sewer - Try waking the sleeping man in the truck. Go to the back of the truck and see the sewer cover. Try opening it. Turn around and see a sewer key in the tool box but the man is facing this way. Go to the other side and turn off the compressor. Go to the tool box and take the sewer key. Use the sewer key on the sewer and realize that you need more strength. Pissoir - Go across the road-fountain and talk to the pissoir attendant. Go inside and do the usual business done in a pissoir. Scaffolding - Go around to the other side of the building away from the pissoir. Jump up and climb to the very top. Walk to the end and jump at the corner of the scaffolding to the other side. The pissoir attendant tells you to come down. How do we distract her from watching the top of the scaffolding? Pissoir - Talk to the attendant, insult the pissoir and get her to check the pissoir again. Run to the scaffolding on the other side of the building. Jump up and climb to the very top. Run to the end and jump at the far corner of the scaffolding to the other side. Go to end of the scaffolding and jump down to the lower level. Take the rope. Climb up at the same place you jumped down and get caught by the attendant again. That's okay - you need to go down anyway now that you have the rope. Sewer cover - In inventory, combine rope and sewer key to make rope tied to sewer key. Use the rope tied to sewer key on sewer cover. George ties the rope to the truck. Try to wake up the truck driver but couldn't. Flobbage - Talk to Flobbage, an old friend. Talk to him about everything - Alphonse and positive discrimination. George expands on the topic of Alphonse's seismophobia. Now, walk to sleeping Alphonse. Watch! Sewer - Enter the manhole. Cross the log bridging the sewer. Study the 3 archway and then walk to the left and around the corner. See a skull door. Use the stone cylinder on the skull's mouth that is out of proportion. Enter the room. Templar headquarters - Go forward until the heavy doors of a chapel like area. Hear voices and see 2 of Susarro's men and a dog guarding this area. Backtrack and go to the branch on the left coming back from the chapel. See a pool of blood. Go forward following the blood tracks to a split of the hallway and take right hall to a locked gate. Go back and go to the other hall where the blood tracks continue. Lounge - Check the room on the left that has lockers. Check the opposite room, the lounge and see a massacre of the Templars. Look closer on the body behind the door and get a rusty key. There is a microwave that has a functioning 10 seconds timer. Go back out and forward to the room at the end of the hall. One of Susarro's men is in the kitchen. George said to find a way to distract him. Distract the guard - This is the hardest puzzle for me in this game. You have 10 seconds to press the microwave, run to the locker room opposite this room, hide, wait for guard to enter lounge, close door and lock him in. In your inventory, place the old key ready to be used. Go to the room where the microwave is located. Start the microwave. Immediately, run out the door and hide in the room opposite to this one. The guard will come and check the noise. When he enters the microwave room, go to the door of the microwave room and close it. Then use the old key to lock the guard in. Go to the kitchen, through the other exit and down the passage following the blood trail. Wine cellar - Enter the wine cellar. The blood trail ends at a wine rack that has 5 bottles. Look at and note what the bottles are. Wine bottle puzzle - Remember what Andre's story about St Stefan's travels: St Stefan carried the relic from Israel, through Italy, Germany and the Rheims before reaching the Berentoires Preceptory. Read George's notebook about this. You have to pull the bottles in order. Look at the shiny star that flickers to see which bottle is the one that George will pull next. Cycle the shiny star using the page up-down keys. Then press the action-gear icon. Pull the green sealed wine from Israel. Cycle the action map using page up-down. Pull the left red sealed wine from Italy. Cycle the action map using page up-down. Pull the right red sealed wine from Germany. Cycle the action map using page up-down. Pull the white sealed champagne from Rheims. Cycle the action map using page up-down. Pull the blue sealed wine from France. Cycle the action map using page up-down. Wine rack moves back and opens. Walk through the tunnel. The wine rack door closes. Go forward and see the dying Templar. With his dying breathe he asks that you find... the others. Protect the key. Look for the statue, it hides the..... Check the Templar's body but no clues are found. Robe room - Go forward, up the steps into a Templar Robe room. The secret door closes behind him. Look at the smashed clock on the floor. It stopped at 3:42. Exit the room using the door on the right of screen. Cathedral - Oh whoopee! Not again! The door you want to get to is across from where you are. There is a guard with his dog at middle of the aisle. There is a guard by the altar. Now what? Study the movement of the guard by the altar. Time your movement well. The corner post by altar is very well lit. Go left using the shadowy, dark areas. Enter the pulpit and read the ornate bible. Hmm, nothing worthwhile. Go pass the pulpit, move towards the back aisle of the pulpit. The post in this corner is well lit. Time your movements to pass the post to go to the back of the altar when the guard goes to the front by the throne and his back is turned. Go to other side at the back of the altar. Time your movement to go to the side aisle pass the post when the guard moves towards the opposite aisle with his back to you. Hide behind the pillar and wait for the guard to go back to the altar and enter the opposite door to the office. Templar's Office - Look around and see a clock that doesn't work but the key to adjust it is still inserted. Go across the room and see 3 statues. At the center is the statue of St. Stefan. Look at statue and then look at the base at the plinth that reads a passage from Revelation. Blessed is he that readeth, and they that hear the words of this prophecy, and keep those things which are written within therein: for the time is at hand. Revelation. Go back to the useless clock. Use the gear icon and select the smashed clock number to set the clock and then St Stefan's year -1247. They don't work. What did the plinth of the statue say? - he that readeth. Where did we see a bible that was readable - Oh No! Go back to the pulpit. My nerves are shot - how's yours? Read the bible and see that the passage of St Stefan is from Revelation 1:03. Save game here!!!! Go back to office. If you get shot, find yourself by the door of the office and have a saved game after reading the pulpit bible, just go in and can proceed with the clock puzzle. There is a God at Revolution! Go back to the clock in the office. Office - Set the clock using the Revelation chapter and verse numbers. The statue of St. Stefan moves and opens a passage. George goes up the stairs to the office of the Preceptor of St. Stefan's Chapter of the Templars. Watch! Goosebumps time! The Key of Solomon releases the Dragon energy. The Preceptor gave him the third of the ancient stone - psi stone. The stones are the only way to stop the Armillary. The Preceptor will send a chivalrous, tenacious, unswerving desire to fight evil knight to do the deed. The Preceptor knighted George. Back in Vernon's apartment, George updates the rest of the gang. Lord Stobbart of Idaho. Talk to Nico about everything. Nico has a satellite map that you can use to see Egypt. Computer satellite map - Select the 3 stones and match them with the satellite map of Egypt. The Psi stone matches the upper delta. The Omega stone is matched to a ruin beside the Nile river. The Alpha stone matches the points of the ruin except for one. George deduced it to be the site of the Armillary. Ruins - 2 guards and a dog are talking by a tented entrance to the side of the ruins. Scout out the area. Watch Nico do a sprint to the left side. Nico makes a sound alerting the guards. Try to get to Nico. Get to Nico - Move left behind the next wall. Wait until the dog leaves and move to the wall where the dog was. Eventually, the guard will move away but the dog stays. Wait and the dog will go back to the guard and he will turn his back. Run to the left of the hill and meet Nico. Talk to Nico. Entrance door - Go left by the wall of the structure and see a square stonework. Look closer and Nico will point out the etching on the stone work - the Alpha, Omega and delta icons. Use the car jack handle on the exposed stonework. Watch Bruno set the key on the ancient control panel, turns it and pulls out a wheel. Anubis tests - After a dark corridor, Nico and George enters a chamber with skeletons. Suddenly, Anubis, Guardian of the underworld appears. Pass 2 test to prove worthiness to pass through. Talk to Nico. First test of authority - Look at the gold round door and see that the icons are matches the 3 ancient stones. Use the 3 stones on the gold round door. The fishy alpha stone, the psi stone with the Nile delta marking and the omega stone are the 3 symbols of authority. Second test of wisdom - Enter the second test room. Anubis appears and presents the test of wisdom. Listen to the story of Horus. Horus test - You have to move 3 figures to the tribunal side of the river. Horus can only carry one at a time. You cannot leave the brother and suspect alone. And also not leave the suspect and witness alone. You have to do this in 7 steps. Go to right side of the elaborate setup. Using the controls - cycle the figures to select them. The panel icon is used to move Horus across the river. 1. Select the killer. Select panel for Horus to take the killer to other side. 2. Select panel to bring Horus back to this side. 3. Select brother. Select panel for Horus to take him across. 4. Select killer. Select panel for Horus to take the killer back this side. 5. Select the witness. Select panel for Horus to take witness across. 6. Select panel to bring Horus back to this side. 7. Select the killer. Select panel for Horus to take the killer to other side. All three are now at tribunal side. The other door opens. Disarming Susarro - Watch Nico and George enter the room with the Armillary. The door shuts and alerts Susarro. Flab was told to kill them. As soon as control is taken and the action gear is seen. Press the jump action button (S). Watch George jump on Flap. The gun slides towards Susarro. Immediately press the grab icon (S). George is hit by Susarro and Nico comes to the rescue. With the baddies asleep, Bruno explains that as long as no one touches the armillary, the events will be fine. Stage right, Petra appears and guess who - the Grandmaster. After disposing of Susarro (shades of Star Wars), Petra and the Grandmaster departs. Talk to Nico and Bruno. Take the Key of Solomon from podium. Climb the steps on the other side of the Armillary. When on the upper level, go left of the screen and see some rubbles. Move towards right of screen (right arrow) when you see a box of dynamite left by the Grandmaster and Petra. George moves towards the dynamite and immediately press S when the jump railing icon appears. Look around and see that there are 2 movable pink stone blocks. Also note that there is a big slab of stone to the left of the floor crack and the rubble at the back of the control panel. Move the pink block that is at the floor crack to make a bridge on the circular walkway around the Armillary and just in front of the control panel. Then move the other block over the made bridge to the side in front of Bruno and Nico. Move the block as close as possible to the right of the crack and left of the rubble behind the control panel. Move the block that is in the floor crack to make a bridge to the left of the crack and across the main floor block you moved to this place. Push the other block to the left of the crack. Push the block to abut the slab at the end of the cracked piece of flooring. Climb up 2xs. 1. Push the top block and follow the purple line for it to end up behind the console. 2. Then push the block in the crack so it follows the blue line just below the top block. 3. The push the top block so it can go to the other side - follow the red line. 4. Then climb on the slab at end. George calls Bruno and Nico to follow. Before leaving, Nico noticed that the lines converge in England - Glastonbury. Horus puzzle room - Since the characters came in the room, see Anubis repeating words of the next test and the penalty associated. Click for George to take a statue and to sacrifice himself so that the others can be released. Nico stops him. While the argument ensues, Bruno decided to sacrifice himself. Nico and George leave. With Harry in his new plane, George and Nico arrive at Glastonbury's main street. They are met by the Colonel and later by Melissa. Glastonbury is flooded. Go down the other end of the road and see razor sharp blockade. Enter the building on the right that contain crates. Note that when the view moved there is a possible exit on the top of the wall that is damaged. The object of the puzzle is to make a 3-crate height on the left under the break at top of the wall. 1. Move the single crate under the break on the left wall to area above the double crates on the left. 2. Move the single crate right of the partial middle wall to top area above the middle wall and right of the Crate at #1. 3. Move a crate under the platform crate. 4. Move the crate under the window on the right to area below the crate of #3. 5. Move the platform crate on the moved crate below. 6. Move the crate at #4 to space left of the now double stacked crates. You should now have 4 layers of crates. 7. Move the top crate to the leftmost crate. 8. Move the single crate to the right of the now double stacked crate under the break on the left wall. 9. Make a space between the 2 crates under the platform. 10. Push the left crate under the platform to the left close to the double stacked crates. 11. Move this #10 crate above the #8 crate under the break on the left wall. 11. Push top crate to single crate under the break on left wall. 12 Climb to the middle wall and push the topmost crate to the double stacked crates. The baddies are here: Now, climb up and over the wall. Nico follows. Meet Petra. Nico will handle the er... Petra and George is to handle the Grandmaster. The Grandmaster changes to the Dragon. George falls in an earthquake fissure. Chamber of the Sword: See King Arthur and Excalibur on the stone. Look at Excalibur and see a plinth on the stone that has the same shape as the Key of Solomon. Place the Key of Solomon on the plinth. Earth energy flows on the plinth and the sword. Take the sword. Arise, Sir George! The first burst of fireballs hits the women on the hill behind George. Run towards the dragon while dodging the balls of fire. Escape the fire of the dragon by hiding behind the pile of stones on the right and the wall to the left. After 3 bursts of fire, the dragon has a brief rest. Run immediately to dragon and use the sword. Defeat the dragon. Watch! Where's Petra? George throws the broken sword in to the river.